Let’s build JNA on a Windows AMD 64. I am always confused about which Cygwin packages I actually need to do that. Every time I get it wrong. So this is what you need beyond the basic Cygwin installation: make, gcc-mingw, mingw64-i686. The latter is important, you need the i686 packages, not the cross-platform x86-64 ones. With these you would still get a failure building libffi, stating that the C compiler can’t produce binaries. Pursuing that I found that libffi will use Visual Studio to build itself on AMD64. 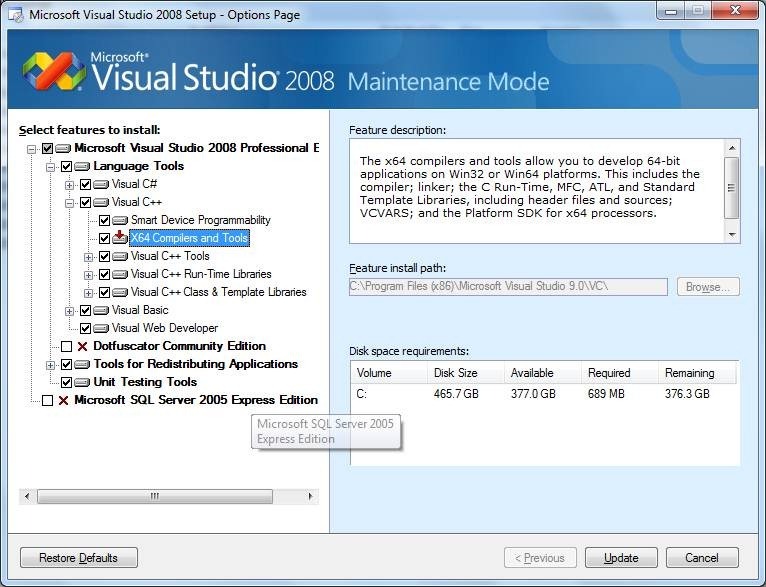 You need Visual Studio 2008, including the X64 Compiler and Tools that aren’t installed by default. The problem persists! Libffi uses cl.sh that does magical things with cl.exe. I managed to hack around it to finally get a Visual Studio cl.exe to work in this environment, but still couldn’t get libffi to build. At this point I gave up trying to get an AMD64 build. But I do have another 64-bit machine where build works! The difference is in JAVA_HOME. With 32-bit Java libffi will build a 32-bit version. With 64-bit Java it will want to be a native 64-bit thing. Installing 32-bit Java and setting JAVA_HOME to c:\Program Files (x86)\Java\jdk1.6.0_22 solves the problem. While this is not a 64-bit build it runs fine on Win-64, enough for development and debugging. JNA: Building JNA on Windows 64-bit was published on December 07, 2010 . See a typo?